A Tesla Fan from the Tesla Motor Forum named Bayol has used his skills once again to create a Model 3 design studio to show the various features on the upcoming Tesla model 3. 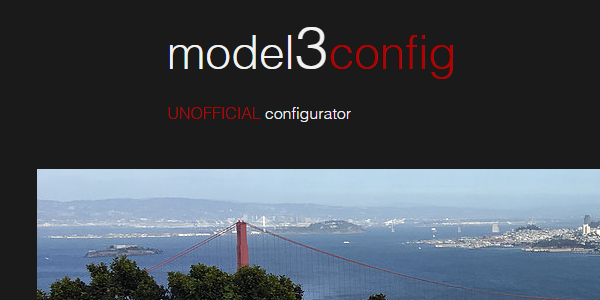 The Model3config.com Website was created by Bayol who previously was responsible for showing Tesla alternative colors for the Model 3. If you have ever shopped or even fantasized about a Tesla Model S the online configurator will be very familiar to you as you can go in and configure your dream car without putting any money down. The official Tesla configurator can be an all-consuming site as you are designing every feature of your vehicle. For the recently released Model X you had to place a $5000 deposit and be invited to use the configurator. Tesla recently opened the configurator for the Model X (without having to place a reservation) almost 7 months after the car was being delivered to customers. If Tesla follows the same pattern with the Model 3 you may not see the official configurator until well into 2018 or later. Bayol make it clear this is unofficial and just simply a way to spend the time waiting for the release of the Model 3 in later 2017. He also plans on adding interior options and additional features in the future (although his current interior picture would be nice in the final version!). With Tesla hiring announcement for the best manufactures I think Tesla should look into their web design department and see if there is a spot for Bayol. Based on the options in the unofficial model 3 Configurator I am partial to the Black Matte with Grey Turbine Wheel, what is your dream Model 3 color and wheel configuration?